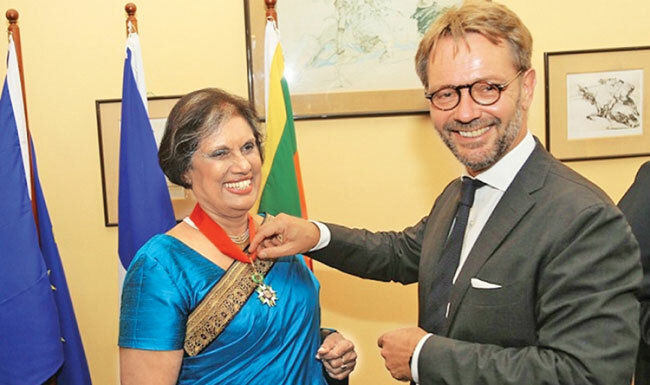 Jean-Marin Schuh, Ambassador of France to Sri Lanka and the Maldives, presented the Medal of “Commandeur de la Légion D’Honneur” on behalf of Emmanuel Macron, President of the French Republic, at a special function held at the Residence of the Ambassador of France. President Kumaratunga served as the 4th Executive President of Sri Lanka from 1994 to 2005. Prior to that, she has held the elected positions of Western Province Chief Minister and Prime Minister of Sri Lanka.